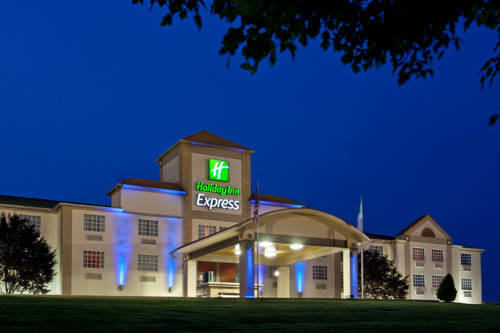 Stay Smart in Delmont as Our Hotel's GuestHere at the Holiday Inn Express Murrysville - Delmont hotel, our comfortable rooms provide a personal retreat in the Pittsburgh area. The hotel's convenient access to businesses, historic attractions, malls and athletic events make us an ideal choice for corporate and leisure travelers.Staying at our hotel in Murrysville places you within minutes of companies like Quadrant, Dominion, Cleveland Brothers and F.S. Elliott. The 625-sq-ft meeting room is ideal for gatherings for up to 25 people and offers A/V equipment and free high-speed, wireless Internet access. Additionally, guests can take advantage of the copy and print services in the Business Center.If you're in search of things to do around the Pittsburgh area, let our hotel's staff help you pick up tickets to see the Pittsburgh Steelers or the Pirates. We're also near the historic Bushy Run Battlefield Park, where patrons can see interpretive exhibits, take a guided tour or participate in an educational program. Additionally, the Pittsburgh Raceway Park and the Apple Hill Playhouse are just minutes from the hotel.We're sure you'll enjoy our great amenities, which include a convenient Fitness Center, Priority Club Rewards and the complimentary, hot Express Start Breakfast Bar. All rooms have a 32-inch flat panel TV, a refrigerator and a microwave. Make your reservations today to enjoy everything our hotel in Murrysville has to offer! The Boulevard takes all the theme of classic Hollywood and blends it with excellent food to make a tremendous dinning experience. Enjoy favorites as the John Wayne Burger to the Bette Davis Brownie. The world famous fast food giant is conveniently located near the hotel with a 24 hour drive thru window to help even with your late night cravings. Serving a large selection of your favorite subs and healthy choices, Subway can definitely fill your lunch or dinner needs. Small meeting facility. Can hold 25-30 people classroom style. Flipchart, overhead projector, wireless internet access,TV, VCR, DVD, projection screen, podium. Located in Greensburg, Pennsylvania, offers fine stores, a Carmike Cinema Movie Theater, and many other specialty retail shops. Filled with rich tradition, come visit one of the most intriguing stadiums ever created. Heinz Field hosts the University of Pittsburgh Panthers and the Pittsburgh Steelers football teams. Concerts are also scheduled regularly. Come watch one of the most historic baseball franchises in the Major League Baseball League. The Pittsburgh Pirates are host to many different Major League baseball teams year round. Go BUCS! Exciting Nightlife including such locations as Saddle Ridge, Buckheads, Bar Room, Whim, Bar Louie and Steelhouse offer music and dancing. Restaurants encompass this areas as well such as the Melting Pot Restaurant, Hard Rock Cafe and Bucca de Peppi. Motocross races are held here at this local attration. Every September the national Motocross races bring in thousands of people. Consessions stand available and fun for all ages! This is a local ice rink used for roller and ice hockey as well as public ice skating.